Wipplingerstrasse 27/Rennegasse 9 is the address of land located at the corner of Wipplingerstrasse and Renngasse in Vienna. 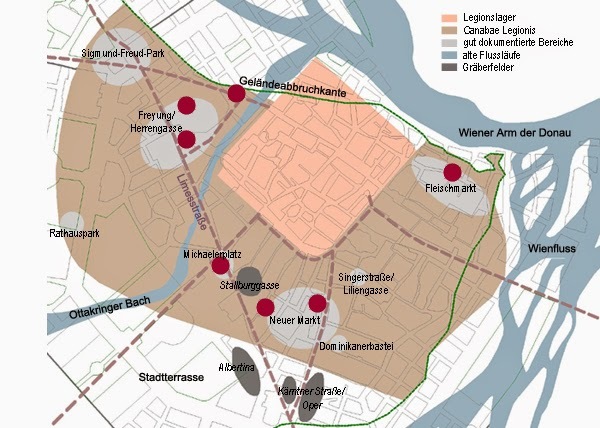 It lies in the city's 1st district about three blocks from the Schottenring. This land is located near the back of Vienna's stock market (Wiener Börse). Also it is a block down Wipplingerstrasse from the massive Central Telegraph Office, which still stands but is closed. At present, a five-story building stands on this site. This building was constructed after World War II to replace the one destroyed during the war. Its first floor corner space is occupied by a store selling high-end furnishings. The history of Wipplingerstrasse 27/Renngasse 9 can be traced back to the last years of the Before Christian Era. In about 50 BCE, Rome established a military outpost called Vindobona in an area that makes up much of Vienna’s present 1st district. Vindobona existed until about 500 A.D.
Wipplingerstrasse 27/Renngasse 9 lay just outside of the fortified Roman military camp (Das Legionslager) that was defended by about 6,000 Roman soldiers. Its location is shown in the map below as the red dot by the label "Geländeabbruchkante," which means escarpment edge. The map indicates that this land was separated from the Roman camp by a stream (Ottakringer Bach) but not an escarpment. Over the centuries much has been built in Wipplingerstrasse and the construction has often exposed Roman walls, most of which, admittedly, were usually demolished and taken away. It was only in the mid-19th Century that people started paying greater attention to the ruins. 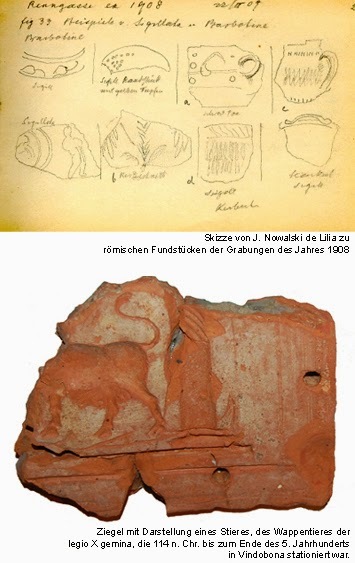 For example, when in 1896 the structure at Wipplingerstrasse 25 – the corner house at Wipplingerstrasse and Renngasse – was removed, the excavation of the floor of the entire building block revealed almost uniformly above the natural clay and gravel, which lay only 4 feet below, the following layers: (1) a layer of small, iron oxide coated pebbles, (2) over that lay a carbon layer 5 to 15 centimeters thick, and (3) over that was at last dirt, richly mixed with fragments of roofing tiles along with two-prong iron hooks, which were used to attach the suspended ceiling tiles to the wooden floors above. On one fragment of the ceiling tiles one saw the beginning of the seal of the 10th Legion; on another was that of the 14th Legion. Further, small pieces of bronze, numerous bones, and vessel debris were found, including a 25 cm bottom portion of a very large bowl whose sides were approximately 15 cm, a fragment of a second similar dish, pieces of terra sigillata, bowls with carved letters M G and S, bowl fragments with fighters, others with running and lying rabbits, fragments of containers, and clay pots with fluted handles. Also found were pieces of flooring, which might have consisted of a coarse mosaic, diamond-shaped, gray, small stones that were 6 cm long, 25 cm maximum width, 2 cm thick. The debris included very many large and small plaster pieces. 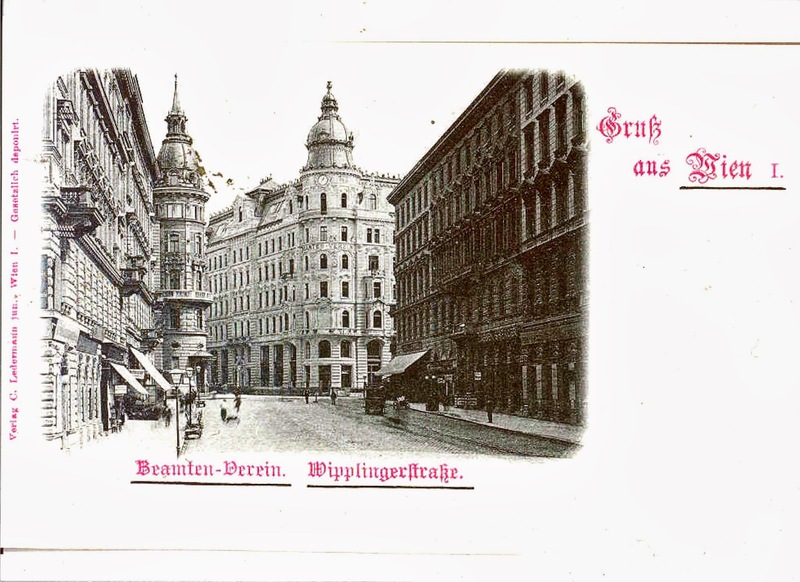 While I have no documentation of how the land at Wipplingerstrasse 27/Renngasse 9 was used during the first 1400 years after the Romans left Vindobona, I do know that in 1895 it was occupied by a five-story building that had been there for some time. In 1895, and perhaps for a few years earlier, the first floor of the building was the site of Café Louvre. Vienna was home to a number of Hebrew enthusiasts, veterans of the Kadimah dueling society, and other Zionist oddities, who had been meeting every Tuesday night at the Café Louvre for years without much of anything to show for it. Herzl had kept the Vienna Kadimah at arm’s length since the publication of his pamphlet [Die Judenstadt], but now he called upon them to assist in establishing a head office, which in short order began agitation for a Jewish state among Jews everywhere. (P. 119, Italics added). Thus, according to Hazony, Café Louvre had been a meeting place for Zionist “for years” before 1896, when Herzl returned to Vienna and began actively leading the Zionist movement. Harzony's statement was backed up by another author, Ernst Pavel, in his book From the Labyrinth of Exile: A Life of Theodor Herzl. He also observed that “Zionist stalwarts” had been meeting, prior to 1896, every Tuesday night “for years” at the Café Louvre (p 309). The name of the owner of Café Louvre is not certain. However, it likely was Wilhelm Aldor, who ran the cafe with his wife Karoline. 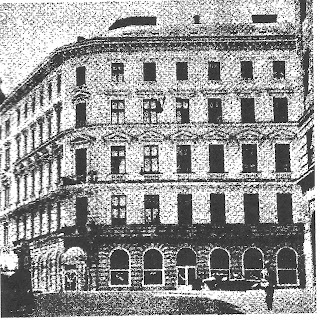 Friedrich Scheu, a Viennese who was part of the circle of journalists who frequented Café Louvre in the 1930s, wrote in his book Der Weg ins Ungewisse (p. 298) about its closing on June 1, 1940, noting that its owner was Karoline Aldor, widow of Wilhelm, who had died in 1936. Several accounts describe Herzl working on Die Welt at the Café Louvre during his time in Vienna. Also, much of Herzl’s staff for the newly formed international Zionist mass movement came from the men who had been meeting “for years” at Cafe Louvre before Herzl returned to Vienna in August 1896. In his book, Pavel wrote that the core of the Vienna general staff assembled by Herzl consisted of “dedicated but hitherto ineffectual Zionists" who had been meeting for several years at Café Louvre” (p. 309. They included physician Moses Schnirer, lawyer Ozer Kokesch, Odessa-born engineer Johann Kremenezky, Shakespeare scholar Leon Kellner, and Leopold Loebl, a relative of Herzl and a financial expert. This list of names includes some of Café Louvre’s earliest customers. Café Louvre continued to be frequented by Zionists and Jewish intellectuals for many years after the turn of the century. For example, the February 23, 1912 issue of the Jüdische Zeitung, published in Vienna, lists Café Louvre as a location where tickets could be purchased for a planned Jewish fundraising event. Of course, Café Louvre had competition for Zionist patronage from other cafes. The 1912 paper contained adverisements Café Maria Theresia, Maria Theresianstrasse 10 (1st District), Café Jägerhof (Weiss), Porzeggargasse 22 (9th District) and Café Marienbrücke, Rotenthurstrasse 31 (1st District). The last two cafes labeled themselves as the “Rendezvous der Zionisten". Relying on his prominence in the Revisionist movement and on his growing chutzpah, he marched to the Café Louvre and asked his friends in Unitas [a Jewish academic group] for a loan of one thousand shillings for the journey. They rallied loyally, and even helped him procure a previous immigration certificate. We can see what Café Louvre looked like during its early years in three post cards published near the turn of the century. 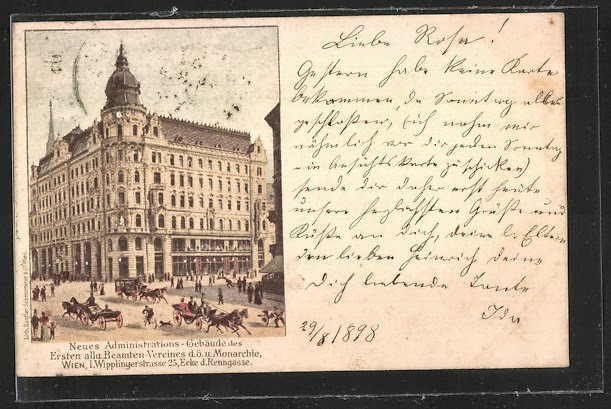 These cards, two mailed in 1898 and other probably in 1900, feature the recently built Beamten-Verein (Public Officials Association) building, located at the corner of Wipplingerstrasse and Renngasse, but also show its neighbor across Renngasse from it. That neighbor was the Café Louvre. 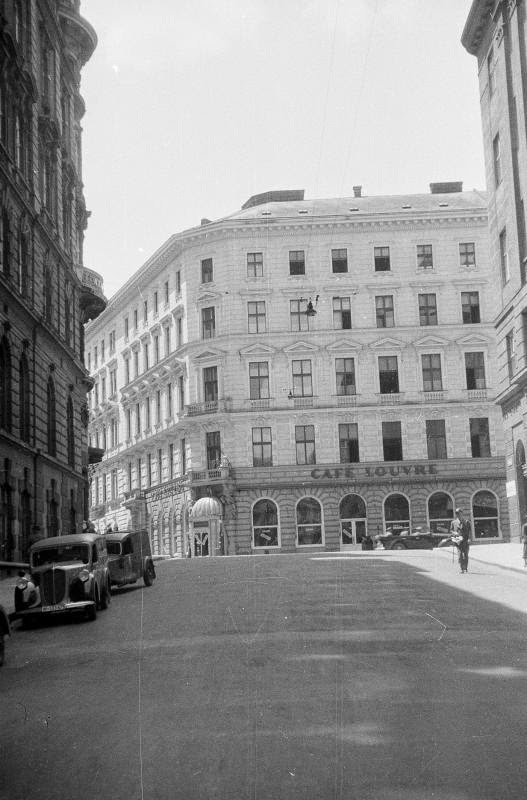 The first picture shows that Café Louvre (in the darker building on the right side of the photograph) was on the first floor of a five-story building. It had an awning covering an outdoor seating area located along Wipplingerstrasse. The building is a darker color than the new Beamten-Verein Building, likely showing it aging. This postcard is undated, but probably was taken in about 1900. The second picture was taken in the same direction as the first, but from a location much closer to Café Louvre. The cafe is the first-floor of the building in the foreground on the right. Its awning and seating area lies just beyond the Josef Flamm sign. The street ahead is Wipplingerstrasse and the Beatem-Verein Building is the light building up the street from the cafe. Another large building across Wipplingerstrasse from the Beamten-Verein is on the left side of the postcard. Note that this postcard is dated December 24, 1898. The third postcard, dated August 29, 1898, shows mostly the Beamten-Verein building, with a sliver of Café Louvre and its awning to the far right. 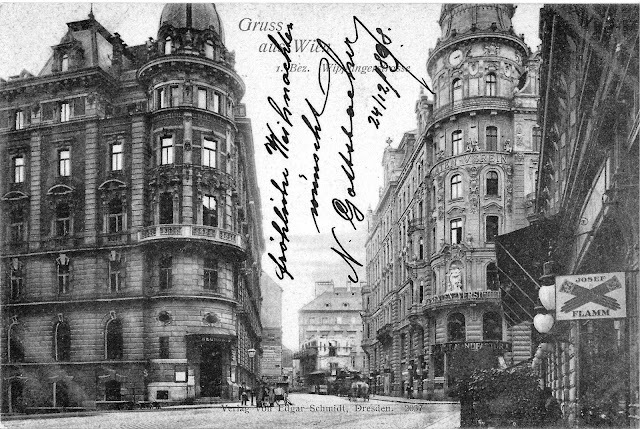 The title underneath the picture says: New Administration Building of the First General Civil Service Association of the Austria-Hungary Monarchy, Vienna I, Wipplingerstrasse 25, Corner of Renngasse. At some point in the middle 1920's, the Café Louvre transitioned from being the hangout for Zionists and Jewish intellectuals to being the place where Anglo-American journalists, and their friends, congregated. Perhaps these two groups overlapped for some months or years, but the few accounts of the Café Louvre Circle that exist do not mentioned that the cafe was shared regularly by the two groups. I have found no good information on the transition, but it has some irony. The man most responsible for making the Café Louvre the de facto headquarters for foreign journalists, as I mentioned earlier, was Robert Best. For some reason, likely its proximity to the Central Telegraph Office, Best started spending his time in this cafe and in the years that followed other American and British journalists joined him. By 1928, it was known as the place journalists congregated and when, for example, J.W. Fulbright arrived in Vienna that year to visit for a few months, he went in the evenings to the Café Louvre listened to the discussions of Anglo-American journalists (see Woods, p. 36).. The irony of the transition is that Best, born in South Carolina, ended up being a strong anti-semite. He stayed in Vienna after the Anschluss and remained in Germany after it was at war with the United States. During the war, his toxic anti-Semitic messages were broadcast from Germany to the United States as part of its propaganda campaign. After the War, Best was captured by the U.S. forces and convicted of treason. So far, I have found only one picture of Café Louvre taken after World War I. One version of it -- quite fuzzy -- was published in a 1968 issue of Der Spiegel (the German weekly news magazine) to illustrate a story about Kim Philby, the double spy, who hung around the Café Louvre in 1933 and 1934. Here is the picture it published. The same uncropped picture is available from a Viennese website. According to information provided with the picture, it was taken on June 3, 1940,two days after the cafe was closed. This picture was taken from a spot on the first block of Renngasse, looking up an incline. The Beamten-Verein Building (not pictured) was located to the left of this building. Note that the awning and seating area are gone. Also, the building seems to have a light exterior, indicated that it likely had been cleaned in recent years. In his memoirs, William Shirer described how he had gone to search for Café Louvre on his first trip to Vienna after World War II, but had found only a collapsed building at the Wipplingerstrasse/Renngasse site. (The Beamten-Verein building and the Central Telegraph building, however, did survive the war.) A few years after the end of the war, a new building was constructed at Wipplingerstrasse 27/Renngasse 9, apparently using the plans of the previous building. In the new building, shown below, the space where Café Louvre was located is occupied by Roche Bobois, a French retail store selling very expensive furniture. Remarkably, if you compare the front of Café Louvre in 1940 and to the front of Roche Bobois in 2013, you will see that the windows and stone design around the windows look the same. Also, the same balcony stands over the corner entrance. Perhaps, although I cannot determine for sure, the corner entrance has the same statues decorating it. If visitors go by Wipplingerstrasse 27/Renngasse 9 today, they will see a facade that is very similar to the facade that was at this site before World War II. Thus, it is still possible to get a sense of the look of the exterior of Vienna's Café Louvre seventy years after it was destroyed. Gelber, Mark. 2000. Melancholy Pride: Nation, Race, and Gender in German Literature. M. Niemeyer. Pavel, Ernst. 2011. From the Labyrinth of Exile: A Life of Theodor Herzl. Macmillan (available as Google e-book). Scammell, Michael. 2009. Koestler: The Literary and Political Odyssey of a Twentieth-Century Skeptic . Random House. Woods, Randall B. 1995. Fulbright: A Biography . Cambridge University Press.